April 25, 2013, 2:16 PM · I don't know who needs a peaceful lullaby more -- a baby or its parents. In either case, violinist Rachel Barton Pine picked the best of the best instrumental lullabies and assembled them in a soothing album called Violin Lullabies, to be released next week. A lullaby album is a slightly ironic choice for Rachel, a self-proclaimed headbanger, who occasionally dons black leather to play in her heavy metal band, Earthen Grave. "I spent all these years as a sort of missionary on behalf of what I think is the greatest music of all, classical music," Rachel said. "I go to my fellow rock fans and say things such as, 'Classical music isn't just pretty, sleepy stuff, it's just as intense and exciting and dramatic as the best rock music!' And now what did I do? I made an album entirely of pretty, sleepy stuff! But you know what? That music has its place, too. As long as people don't think that's the only thing classical music is, why not indulge?" It's actually not so easy to find an album of classical lullabies. "Most things are synthesized, or there will be an orchestral collection of slow movements, which are pretty and slow, but they're not specifically lullabies," Rachel said. "That was exactly why I made the album, because I realized that nothing that I was looking for for my daughter actually existed!" Another reason "goes back to my usual, geeky, sheet music collecting habits," Rachel said. "Years ago, I started to notice that various composers had written berceuses for the violin. ("Berceuse" being the French word for "lullaby") I would buy somebody's 'Six Short Pieces' or a random collection of their works, and I'd notice, 'Oh, there's a berceuse in there.' This kind of struck me, at the time, as being intriguing because… these very short, delicate, unabashedly melodic, very simple little pieces -- it's almost like repertoire that we don't pay a whole lot of attention to any more." So the idea for an album of all lullabies, berceuses and wiegenlieds began many years ago. When her daughter, Sylvia, was born in 2011, "I decided to finish the project," Rachel said. "I have a great nursing pillow, so she would be breastfeeding while I was on my laptop, contacting libraries around the world. I thought, if I don't keep looking and get every last one I can possibly get, maybe I'll miss a gem or two. I ended up compiling more than 150 of these pieces." Most people know that Johannes Brahms wrote a lullaby, a tune which remains a favorite today, sung worldwide by mothers in rocking chairs, co-opted by characters on television shows and embedded in the musical mobiles hanging over babies' cribs. But lullabies flowed from the pens of many other famous composers: Manuel de Falla, Gabriel Fauré, Edvard Grieg, Maurice Ravel, Ottorino Respighi, Franz Schubert, Robert Schumann, Jean Sibelius, Richard Strauss, Igor Stravinsky and Eugene Ysaÿe, to name a few. In all, Rachel's album includes 25 lullabies, with an extra three included in the download-only version. She is accompanied by pianist Matthew Hagle. "Indeed, some of the composers on here are very famous, some are semi-famous, and some are completely and utterly obscure," Rachel said. "Who has ever heard of Mikhail Antsev or Vladimir Rebikov or Ludwig Schwab? Or Alexander Iljinsky? It's a funny thing: Iljinsky's lullaby kept popping up in collections from the late 1800's called, 'Favorite Violin Music,' or, 'Best-Loved Violin Recital Pieces.' I thought, 'Wow, here's this 'One of the Most Popular Violin Pieces,' and yet now, we've not only not heard of his lullaby, we haven't even heard of him! Or Camillo Sivori -- we know him as Paganini's only student. But his lullaby, according to the sheet music published in the 1800's, is his 'best-known piece'! And now, we've never heard of that piece, or any of his others!" One of the beauties of these pieces is that they are short and self-contained. "It's amazing how much sophistication can be brought to a piece of two minutes long," Rachel said. "Every single one of these pieces is a lullaby, and yet every single one of these pieces is a legitimate work of classical concert music. This is not 'Rock-a-bye Baby' arranged for the violin. That might have been quite nice, but that wasn't the direction I wanted to go in. I wanted to find actual concert music that happened to be lullabies." "Violinistically, what's fascinating is a way of approaching the instrument physically that is limited, and yet allows for a great deal of individuality within those limitations," Rachel said. "You're not going to let your vibrato ever be as robust as it can; you're not going to ever let your sound fully bloom. Yet within the delicacy and the subtleties, you have so much room for nuance and color." "Some of them, I really envisioned that they were describing the warmth of rocking your baby and lulling them to sleep," Rachel said. "Some seemed to be describing sleep itself: very delicate and peaceful, like the feeling you get when you look in on a little sleeping angel baby. And some of them, I'm convinced, are almost creating a dreamscape: that mysterious, magical, other-worldly quality of our dreams. " "About half of the tracks use mute. I can't even think of any other violin album in which half of the entire CD is muted!" Rachel said. "But I did not use the mute that I use in concert, which is one of those little violin-shaped mutes, the kind that's made out of a softer rubber than a Tourte mute. If I'm performing the second movement of the Tchaikovsky Concerto, for example, I basically want the impression of a mute, but I still need to be able to project my sound to the back row. For the recording, with the microphones up close, I could really go for color; it didn't matter if the decibels were softer than would work for stage. Luckily, my friend Fred Spector, the retired longtime first violinist of the Chicago Symphony, owns the world's largest collection of stringed instrument mutes. I actually had two podcast episodes (Episode 11 and Episode 13) early on in my Violin Adventures podcast, about Fred and his mute collection. He has about 5,000 different mutes, representing 2,000 different types." "I actually got to go through his collection and pick different shapes, different materials, and find three for the recording. I basically grouped the muted lullabies into those three categories: the warm, soothing ones (using a leather mute, that I actually do own, and that's more of a round shape, a little bit thicker); the delicate, dreamy ones (sort of a rectangular-shaped leather mute with two feet); and then the mysterious ones, where the mysterious-sounding mute (made out of resin, kind of like a lady's hair clasp of 100 years ago, and shaped almost like a practice mute though lighter, very large, with three feet) made them even more mysterious!" The search for the perfect tone color didn't end there, either. Rachel had luthier Paul Becker do a tonal adjustment on her instrument for each set of lullabies in each category. "Two of the three mutes caused my violin to have wolfs, and by bad coincidence, some of the notes that got wolfed were notes that feature prominently in the pieces I was playing with that mute!" Rachel said. "So I had my luthier readjust the feet of my bridge for each group of muted lullabies. I had my normal tonal adjustment for the unmuted pieces, and then he adjusted it for one mute, adjusted it for another mute, and adjusted it for another mute as the session went along. Obviously, in concert, you're not going to be changing your adjustment in the middle of the performances. But believe me, without changing the adjustments, the wolfs would have been machine-gunning in the middle of a delicate lullaby. That just wouldn't have been good! WFMT studio is only a 20 minute drive from downtown Chicago, so I just popped into the shop before each day's session, when I was doing the different groupings of muted lullabies." Now that Rachel has uncovered so many lullabies and chosen her favorites, she will also release the collection as a book of sheet music, with her own fingerings, bowings and performance suggestions. That likely will come out later this summer. "It will be a very generous collection. Some of these pieces are out of print, others you can find quite easily, and everything in between," Rachel said. "There will be edited versions with all of my fingerings and bowings that match what I did on the album. And then the piano accompaniments will be included as PDFs on the CD-ROM, which will also include music-minus-one tracks, played by Matt Hagle." While the pieces are sophisticated enough to be performed by professional artists, "the technical level demanded to play the notes is intermediate. Most of these lullabies can be played by intermediate students or adult amateurs," Rachel said. "There are three that are a little bit more difficult, and I've actually provided simplifications of them. So almost all of these pieces can be played by people who aren't very advanced on the violin, which is really exciting. I can just imagine a sibling, or a parent or an uncle or an aunt or a grandparent, being able to welcome the new baby in their life with their own renditions of some of these lullabies, with the music from the sheet music book." How does the 18-month-old Sylvia feel about all these lullabies? "She certainly heard me rehearsing them, and picking them and playing the edited versions back and playing the rough takes back so that we could look at track order -- she's heard them a million times," Rachel said. When she hears her mom playing, though, she tends to perk up attentively instead of nodding off. When Rachel wants to lull Sylvia, she's more likely to sing to her, and hold her. "That's the thing -- when people ask, 'Are you playing these to your baby live and in person?' Well, how can I nurse her and play the violin at the same time? (She laughs) I sing to her, just like my mom sang to me," Rachel said. "Of course some of the tracks on 'Violin Lullabies' are our songs, like the Brahms and the Schubert and the Summertime. Then of course we have a lot of the folk song lullabies as well that I like to sing to her." She also sings Sylvia songs from Suzuki Book 1. "When Suzuki chose these German folk songs, one of the reasons he selected a lot of them is because they were songs that German parents of that time traditionally sang to their children. They were tunes that kids would already have in their ear, and then start to play on the violin," Rachel said. "That whole concept sort of gets lost when you take the Suzuki repertoire to parts of the world where those folks songs were never folk songs, or now probably even in Germany, the parents no longer sing those old songs. But I thought, rather than playing the CD of a violinist playing folk songs, why don't I just use some words? I got various lyrics from some of my friends who are Suzuki teachers, and from my sister, who had a whole set from her Suzuki pedagogy class that she took during her masters program. For some of them I've just made up my own silly words; I have a set of words for Perpetual Motion about dinosaurs. So I actually just sing the Suzuki songs to her! She does have a little 32nd-size violin, and we get it out every day. She knows the names for all the parts, and she knows which is her bow hand, and how to put her hand on the shoulder of the violin and put it up on her shoulder. Obviously she doesn't yet have the physical coordination to be able to do anything for real, but I'll bow a few "Mississippi Hot-Dogs" across the strings with her, and she gets a big smile on her face." Incidentally, Sylvia is one well-traveled toddler: She already has 16 stamps in her passport, and by the time she hits her third birthday, she'll likely be eligible for Executive Platinum -- she can upgrade to first class! Rachel has traveled with her husband, Greg, for 17 years, and that's simply how life is for them, and now for Sylvia. But finding a nanny was a challenge. "Sylvia started touring with me when she was three weeks old," Rachel said. "Our first nanny was from a traditional nanny agency. We explained the lifestyle to her, and she said she was up for the adventure, but it turns out that she had been a little bit unrealistically optimistic. After about three months she said, 'You know, I just can't do this any more,' and really left us a bit in the lurch, because she quit suddenly and unexpectedly." The mother of a Vamos student stepped in and traveled with them for five months, while they found a new nanny. They ultimately found one through an agency especially for musicians, called ChARTer Nannies. "It's a great idea because there's a self-selection that goes on -- nobody is going to sign up with the agency unless they are actually looking to live that lifestyle, which is a lot different from somebody who reluctantly agrees to try it," Rachel said. "These are young ladies who love traveling, love music and are not put off by the flexibility and unpredictability of a schedule where the flight might be late, then we have dinner with the conductors and the donors at 11 p.m., then a 7 a.m. radio show the next day -- it can be very, very intense." BELOW: Rachel Barton Pine plays Rêve d’ Enfant (Child’s Dream) by Eugène Ysaÿe, with album collaborator and Matthew Hagle; from a WTTW Chicago Tonight show. 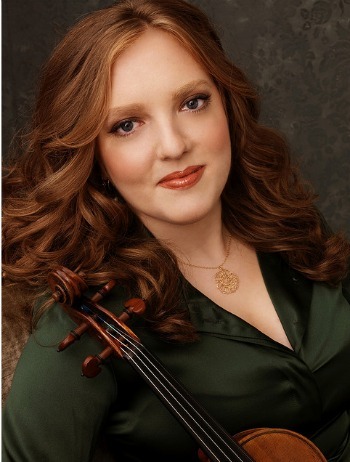 BELOW: Rachel Barton Pine plays the Brahms Lullaby on her 1742 "ex-Soldat" Guarneri del Gesu, which was picked by Brahms himself for his protégée, Marie Soldat. April 26, 2013 at 12:13 PM · Hi Rachel. I have been looking for violin lullabies too. What a lovely idea! By coincidence I just wrote a violin lullaby for my expectant wife to play which we have just recorded for a CD. April 26, 2013 at 02:12 PM · I love that she is releasing the pieces as a collection playable by intermediate players and adult amateurs. I can picture parents playing them to their children at night. April 26, 2013 at 04:57 PM · My children are too old to play lullabies for, but I can't wait for the sheet music collection to come out. How wonderful that she is making her research available to us all! April 26, 2013 at 10:28 PM · Always enjoy watching Rachel play. Looks like she is truly enjoying giving to her listeners. Some violinists are struggling too much to ever smile. Not to mention her superhuman playing abilities . . . . Well, I can at least smile when I play. Thanks, Laurie and Rachel both for this interview. Will put the CD on my shopping list, along w/ the music. Thanks, Rachel! @ Roland: Your song is also beautiful, and beautifully played by you and your wife. Best wishes to you both. April 27, 2013 at 08:23 PM · i too enjoy watching herplay. she comes across as being a warm and genuine person as well! also, on a side note, the video is very nice in that it shows her bowing as well, angling in and out. April 28, 2013 at 10:36 PM · NICE instrument; but I wonder how this music would sound on the "Sleeping Beauty" Strad. May 2, 2013 at 03:50 PM · Just downloaded it on spotify.... I LOVE IT. Can't wait for the book.